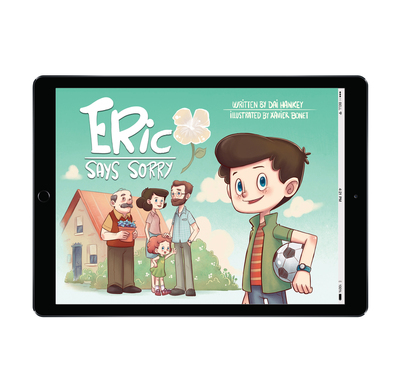 Full size images of the awesome illustrations in Eric Says Sorry to use on big screens. Together with the story book these images allow you to read the story while showing the pictures on a large screen so that everyone can see them. Eric Says Sorry is the tale of Eric's terrible accident when his football smashes neighbor Percy's pot of prize pansies. He tries to get away with it. But when none of his tactics work, Eric says sorry. His father pays for a new pot and Eric learns that grace is epic. A great way to teach children about grace and repentance.